Recent earthquakes in Japan may have shaken Canadians’ confidence in nuclear power as a safe source of energy. In a new Abacus Data National Poll almost half of Canadians (49%) said that their confidence in the safety of nuclear power has worsened because of the events in Japan, while two in five said their view has not changed. Women were more likely than men to have their confidence level worsened (56%, 42%, respectively) as were Canadians ages 31-60 (53%). Regionally, Ontarians and Atlantic Canadians were less likely than residents of the other provinces to say they their confidence in nuclear power has gotten worse. 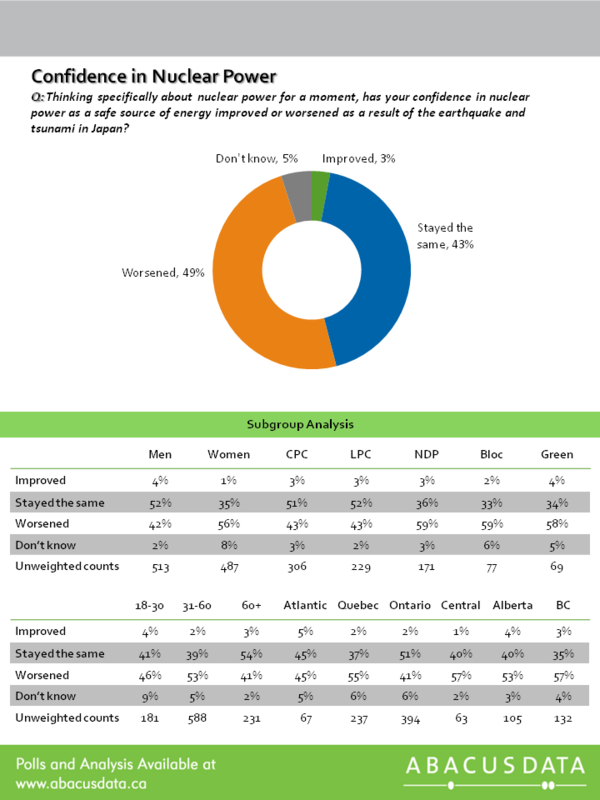 Almost six in ten of NDP supporters (59%) say they are less confident in nuclear power’s safety compared with Liberal and Conservative supporters (43% each). The events in Japan come at a time when a number of provinces have plans to expand their nuclear power facilities. The survey found that a plurality of respondents (43%) believed that the safety of nuclear power is in question and that we should hold off building new plants. In contrast, 22% believed that Canada should build more plants compared with only 15% who want current plants shut down immediately. The survey found clear differences among demographic groups about what to do with current and future plants. One-third of men (32%) believed in the safety of nuclear power and think more plants should be built compared to only 13% of women. Older Canadians (60 and up) and residents of Central Canada, Alberta, and Ontario were also more likely to support building more plants. Compared with other forms of electricity production, respondents were less likely to support supported nuclear and coal, while a majority supported solar power (85%), hydroelectric power (80%), and wind power (79%). Coal was the least favoured method of electrical production, with half of Canadians (50%) opposed to it. For more information about the survey findings, please contact Dr. David Coletto, CEO Abacus Data Inc. at (613) 884-4730 or david@abacusdata.ca.